Mary Baker Eddy (1821-1910) was an influential American author, teacher, and religious leader, noted for her groundbreaking ideas about spirituality and health, which she named Christian Science. 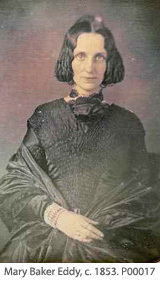 She articulated those ideas in her major work, Science and Health with Key to the Scriptures, first published in 1875. Four years later she founded the Church of Christ, Scientist, which today has branch churches and societies around the world. In 1908 she launched The Christian Science Monitor, a leading international newspaper, the recipient, to date, of seven Pulitzer Prizes. For an annotated chronology of Mary Baker Eddy’s life (PDF file), click here. Born on a farm in Bow, New Hampshire, she was the youngest of Mark and Abigail Baker’s six children. Her formal education was interrupted by periods of sickness, but when not in school she read and studied extensively at home, writing prose and poetry from an early age. Her parents sought help from physicians for her ailments, but the treatments brought only temporary relief. Raised in a deeply religious Congregational home, she rebelled against the Calvinist doctrine of predestination at an early age, and regularly turned to the Bible and prayer for hope and inspiration. In December 1843, Mary Baker married a promising young building contractor, George Washington Glover, moving with him to the Carolinas. He died the following June, three months before the birth of their son, George. She found shelter and support for herself and the boy back in her parents’ New Hampshire home until her mother’s death in late 1849. In 1850, still suffering from recurring bouts of illness and no longer having her mother’s help, she found she had no choice but to place George in the care of the family’s former nurse and her husband. In 1853, Mary Baker Glover married Daniel Patterson, an itinerant dentist who proved to be unreliable and unfaithful. He abandoned her in 1866, and, after years of living apart, she divorced him in 1873 on grounds of desertion. Struggling with chronic illness compounded by personal loss, Mary Patterson was preoccupied with questions of health. Like many in her day, she avoided the harsh treatments of conventional nineteenth-century medicine and its dangerous side effects. She sought relief in various alternative treatments of the day, from diets to hydropathy (water cure). During Patterson’s long absences, she studied homeopathy in depth and became intrigued by its emphasis on diluting drugs to the point where they all but disappear from the remedy. At one point, she experimented with unmedicated pellets (now known as placebos) and concluded that a patient’s belief plays a powerful role in the healing process. While investigating such new cures, she continued to seek comfort and insights in the Bible, still drawn by the healing record contained in its pages. In 1862, as the Civil War raged, Mary Patterson sought help from Phineas Quimby, a popular healer in Portland, Maine. Her health initially improved radically under his treatment, which included a combination of mental suggestion and what might now be called therapeutic touch, but she soon suffered a relapse. She returned to Quimby not only for treatment but also to learn more about his approach. Thinking that he had rediscovered a divine healing method, she spent hours discussing and exchanging ideas with him. In time, she concluded that Quimby’s technique depended largely on his vigorous personality and his training in hypnosis rather than on some divine principle. A turning point occurred in 1866 when a severe fall on an icy sidewalk left her in bed in critical condition. Quimby had died just one month earlier so she could not turn to him for help. She asked for her Bible and, while reading an account of healing, found herself suddenly well. Eventually, she referred to this as the moment she discovered Christian Science. Mary Patterson could not explain to others what had happened, but she knew it was the result of what she had read in the Bible. Her conviction grew in the coming weeks and months as setbacks were met with even stronger proofs of spiritual healing. This led to nine years of intensive scriptural study, healing activity, and teaching, culminating in the publication of Science and Health in 1875. In this book she marked out what she understood to be the “science” behind this healing method. As she saw it, the healing works of Jesus were divinely natural, and repeatable. Over the years Mary Baker Eddy taught her system of healing to hundreds of women and men who in turn established successful healing practices across the United States and abroad. In 1877 she married one of her students, Asa Gilbert Eddy, who gave her unflinching support and the name by which she became best known. He died in 1882. Disappointed that existing Christian churches would not embrace her discovery, Eddy started her own. In 1879 she secured a charter for the Church of Christ, Scientist, established “to commemorate the word and works of our Master, which should reinstate primitive Christianity and its lost element of healing.” Two years later, she founded the Massachusetts Metaphysical College, where she taught her classes until 1889, when she closed the institution to focus on a major revision of Science and Health. As teacher, author, and preacher, Mary Baker Eddy was leader of the burgeoning Christian Science movement. In 1888, a reading room for her writings and other publications opened in Boston. In 1894, Boston-area Christian Scientists moved into their own first church edifice (The Mother Church), built under Eddy’s direction. In 1895 she published a church manual, establishing guidelines that are followed to this day. It is in this slim volume that she made provisions for a lay ministry in Christian Science churches around the world, with locally elected readers who read a weekly “Bible Lesson-Sermon” of passages from the Bible and Science and Health with Key to the Scriptures. Eddy went on to found The Christian Science Publishing Society in 1898, which became the publishing home for numerous publications launched by her and her followers. Plan a visit to The Mary Baker Eddy Library.